Not to be confused with Peter Arbo (academic). Peter Nicolai Arbo (June 18, 1831 – October 14, 1892) was a Norwegian historical painter, who specialized in painting motifs from Norwegian history and images from Norse mythology. 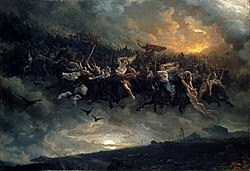 He is most noted for The wild Hunt of Odin, a dramatic motif based on the Wild Hunt legend and Valkyrie, which depicts a female figure from Norse mythology. Peter Nicolai Arbo grew up at Gulskogen Manor in Gulskogen, a borough in Drammen, Norway. He was the son of headmaster Christian Fredrik Arbo (1791–1868) and his wife Marie Christiane von Rosen. His brother Carl Oscar Eugen Arbo was a military medical doctor and a pioneer in Norwegian anthropologic studies. Arbo's childhood home, Gulskogen, was built in 1804 as a summer residence for his older cousin, lumber dealer and industrialist Peter Nicolai Arbo. Arbo started his art education with a year at the Art School operated by Frederik Ferdinand Helsted (1809–1875) in Copenhagen (1851–1852). After this, he studied at the art academy in Düsseldorf. From 1853 to 1855 he studied under of Karl Ferdinand Sohn, professor of Kunstakademie Düsseldorf, and from 1857 to 1858 under Emil Hünten who was a battle and animal painter. At Düsseldorf he was for some time a private student of the history painter Otto Mengelberg (1817–1890). He had contact with Adolph Tidemand and became a good friend of Hans Gude both of whom were professors at the art academy in Düsseldorf. He is associated with the Düsseldorf school of painting. In 1861 Arbo returned to Norway and the following year he went on a study trip together with Gude and Frederik Collett. In 1863 he painted the first version of Horse flock on the high mountains, a motif he later on took up again several times. The version from 1889 is at the National Museum of Art, Architecture and Design (Norwegian: Nasjonalmuseet for kunst, arkitektur og design) in Oslo and is considered one of the most important of his works. In 1866 he was appointed a Knight of the Royal Norwegian Order of St. Olav and the Knight of Order of Vasa. He held numerous positions, including as a juror in Stockholm in 1866 and Philadelphia in 1876, and was Commissioner of the Viennese art department exhibition in 1873. He was also a member of the National Gallery Company from 1875 and director of the Christiania Art Society from 1882 until his death. Drammens Museum (Norwegian: Drammens museum for kunst og kulturhistorie) is located in the heart of Drammen, on the southern side of the Drammen River. In earlier years this was an area of elegant country houses on the magnificent landed property known as Marienlyst. Exhibits of the museum include items from the historical and cultural background of Norway. Drammen museum consists of five departments including Gulskogen Manor, the childhood home Peder Nicolai Arbo. In the many beautiful rooms of Gulskogen Manor, one will find works by this distinguished history-painter. ^ "Peter Nicolai Arbo". Store norske leksikon. ^ "Arbo". Store norske leksikon. ^ "Gulskogen gård". Store norske leksikon. ^ "Arbo. Expert art authentication, certificates of authenticity and expert art appraisals - Art Experts". artexpertswebsite.com. ^ "Drammens Museum". Store norske leksikon. Wikimedia Commons has media related to Peter Nicolai Arbo.